If you are short on time, or just want to increase your level of relaxation, Footopia’s Spa packages are exactly what you need. 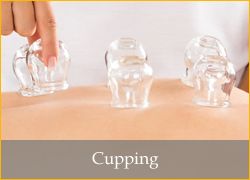 The spa packages include any of our treatments, such as massages, manicures, pedicures, facials, waxing and/or cupping. You can choose from any of the spa packages we have available, or feel free to customize your own package to suit your specific needs. 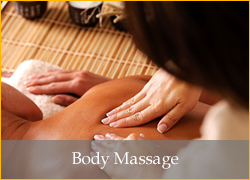 Our spa packages are designed to spoil you from head to toe in a relaxing environment where you can unwind and relax. Our highly trained team members are able to locate and treat any sore areas that you have in your feet, legs, arms and back with massage and reflexology, and can improve the appearance of your nails with a manicure or pedicure. 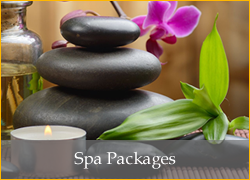 Our packages are designed to give you all the pampering you need in one visit making it easier for you to be able to fit relaxation into your lifestyle. Footopia offers spa packages to the Coral Springs and Parkland communities with a goal to provide excellent care in a relaxing environment. Treating yourself to a spa package is a great way to relax and unwind, and is also a fantastic way to manage any aches and pains in your body. There are numerous benefits of getting massages, pedicures and manicures on a regular basis, and include improved circulation in the body, reduced stress and anxiety levels, increased range of motion, sleeping better, managing low back pain, and more. If you are unsure of where to start, our team members are here to help. 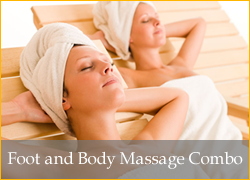 They are able to not only help you to choose which package is best for you, but they can also customize a spa package to fit your specific needs. Relaxation is just a call away, and we’ll be happy to give you the treatment you need for a more relaxed and refreshed body from head to toe. You can count on us to wait on you hand and foot! Our signature pedicure begins with a relaxing herbal foot soak, and an exfoliation treatment that includes intensive cuticle grooming and callus removal. After a layer of sea scrub and sea salt glow, a mud mask is applied creating a cooling sensation as it dries and is removed. Dead skin and roughness is sloughed off. Your nails are trimmed, shaped and buffed to a perfect glow. Now, warm towels and paraffin wax combine to stimulate circulation, soften skin and relieve tired feet. Treatment continues with 30 minutes of foot massage/reflexology and a wide choice of nail polish. You deserve this ultimate, all-in, foot care experience for your tired, achy feet. Begin with an Herbal foot bath with your choice of aromatic oils. 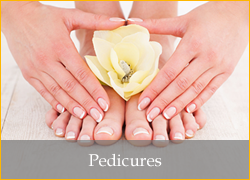 Continue with a pedicure that trims, shapes, buffs and beautifies your nails. Now, an exfoliation treatment, cuticle grooming and the gentle removal of calluses. Then follow layers of sea scrub and sea salt, readying your feet for a comforting, hot paraffin treatment. 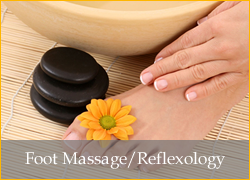 Now your smooth, silky feet, and your hands arms and scalp, are ready for a full 60 minutes of massage/reflexology. Add your favorite polish and rejoice in all the benefits of Footopia's best foot package.